Tommy Gun's is growing, fast. With over 70+ locations across North America and Australia, the company has given a fresh new style to thousands of heads and faces over the past few years. The time had come for TommyGun’s itself to give its online face a fresh new look to coincide with those customers. From the outset, the executive and marketing team at Tommy Gun's knew that they wanted a contemporary look and feel without sacrificing the personality, style, and tone of the original brand design. 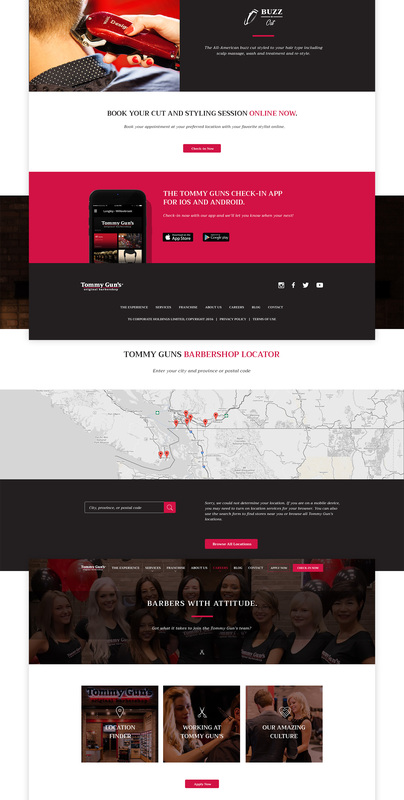 The company was still growing quite fast, so there was an underlying need for a website that not only promoted hairstylist careers at TommyGun’s but also attracted new franchisee possibilities. At the time, the company’s website not only looked outdated, but it also lacked the ability to scale with the needs of their growing business. Initial information architecture and wire-framing uncovered new ways to smoothen the customer journey from initial page landing through to appointment bookings. TommyGun’s already had a mobile app which was capable of displaying wait times, so making the website talk to the application and display the same information directly on the website was a no brainer. Having a strong structure in place, we were now able to start thinking about aesthetics. Having never experienced first hand, we didn’t quite have a clear direction in mind for the brand yet. Fortunately a TommyGun’s location is almost always within range in most cities across Canada, Vancouver being no exception. After visiting a retail location and getting the full Tommy Gun's experience (with all of us losing our hot towel shave virginity) we knew that safekeeping the tenets of the original brand were key--therefore, we took an evolutionary approach to the new online brand. After our experience, we were able to translate the look and feel that embodied what the Tommy Gun's living brand to the digital realm. A modern bold look while maintaining classic elements of the 1930s barbershops. With the use of a large amount of organic un-staged photography sourced from TommyGun’s Instagram account, mixed with real employee testimonials, the company can now showcase its welcoming atmosphere to potential talent in the hairstylist industry via its Careers page directly within the website. A clear, values driven approach was used to explain the potential each TommyGun’s location possess, helping boost franchisee trust and interest. TommyGun’s now has a user focused website with the modern style that the users are looking for themselves. With the ability to scale with their business.